The mitochondrion is the cell’s energy-generating furnace. Called an “organelle,” the mitochondrion is a self-contained structure inside the cell. Like all cellular structures, the mitochondrion is surrounded by a membrane. This membrane is an impenetrable barrier to acyl-CoA esters; passage across the membrane requires L-Carnitine as a transporter. On the inside of the mitochondrial membrane, the acyl-CoA esters are made available to be metabolized through the process of beta oxidation. One of the key metabolic byproducts of this process is acetyl-CoA, also called “active acetate,” which enters the Krebs cycle (also known as the “citric acid cycle”) to supply fuel for production of ATP, the cell’s primary energy “currency”.” L-Carnitine shuttles excess fatty acid residues out of the mitochondrion. And in this role is essential for preventing toxic buildup of fatty acids inside the mitochondrion. Evidence suggests that L-Carnitine and short chain acyl-carnitine esters can protect the mitochondrion from adverse effects of drugs and toxic chemicals. Muscle tissue contains a high concentration of L-Carnitine. With its constant energy needs, heart muscle tissue is especially rich in L-Carnitine. Unsatisfactory production of L-Carnitine by the body can result from a variety of factors, including increased catabolism or the inability of tissue to extract and retain L-Carnitine from the blood. At high concentrations, L-Carnitine demonstrates a clear-cut ability to potentiate the contractility of isolated heart muscle tissue, indicating an enhanced effect on the heart health.³ L-Carnitine has been shown to improve the performance of rats subjected to fatigue tests. 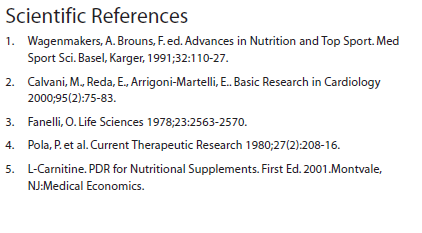 L-Carnitine may promote maintenance of healthy blood lipids. 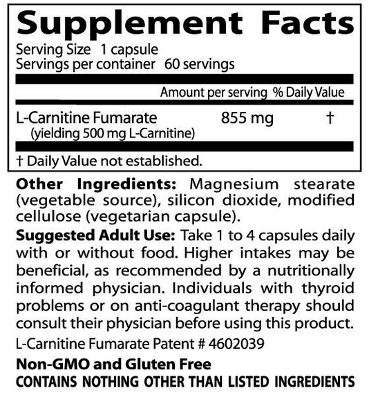 Preliminary evidence of this was seen in a small open trail of 26 participants who took 3 grams of L-Carnitine daily for 40 days.4 The results of these and other studies suggest that oral consumption of L-Carnitine has a beneficial influence on maintaining a healthy heart and cardiovascular system.